So as Fall is very quickly approaching, of course the available foods are changing also. 1. Concord grapes- they are full of antioxidants and have a much fuller flavor than regular store bought grapes. 2. Pears- these beautiful fruits are full of fiber and can be cooked with and eaten like apples. 3. Butternut Squash- this squash is low in calories, chocked full of nutrients, and is very versatile in different recipes. 5. Pumpkin- pumpkin is high in Vitamin A and only has 49 calories per cup. This year, I would love to incorporate some pumpkin into my oatmeal! I have heard of it done before and it sounds awesome! 6. 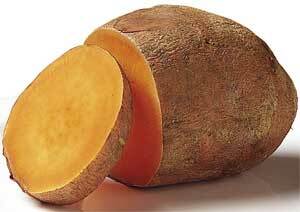 Sweet potatoes: these are high in iron and Vitamin A. These are great in place of regular potatoes and taste AMAZING baked into fries. 7. Root Vegetables: some examples are rutabagas, turnips, and parsnips. These are also great alternatives to regular potatoes and are found in many fall/winter recipes. And there you have it! Great fruits and veggies for Fall! What are some of your favorite healthy fall foods? Hi there! I can hang with everything but the rutabagas and turnips and am a fellow coupon clippers so we are of a like mind and I hope that when you take a break that you will stop by my blog and follow me back? I love soups too and especially butternut squash soup! How do you make yours? I made it a couple times but it was lacking in something. Wow...I did pretty good with this list. I love, love butternut squash and the ones coming out of the garden this year look great. We eat sweet potatoes 2-3 times a week. I'm microwaving them - how does that affect the nutritional content?? Great site. Excited to follow you along your journey. Thanks for stopping by my blog and following. You found me through a weekend blog hop , so I came to see your blog! What a treasure it is - I love to tell my patients about healthy foods, so will be following your blog with great interest! I found out about your blog via the Saturday Blog Hop and I'm so glad I found you because I love dachshunds and I can't wait to see a picture of Ava and because I am in some serious need of a nutritionist because I am gluten intolerant and have been since December 2009. I cannot afford a nutritionist/dietician at the moment so I will go to your blog now for some advice! Luckily, I've been a healthy eater and never turned my nose from any of those the fruits and veggies you've mentioned here! I love squash for a fall evening side dish! Hi! Thanks for stopping by!! Thank you & I love your blog also. I am following you now, & I invite you to follow me. I have Greek heritage & Italian heritage. As far as foods go I wasn't exposed to Greek foods growing up. I didn't find out I had Greek heritage until later on in my life. I would love to try some though. Are you Greek? I hope you enjoy your Labor Day weekend as well! Hope you join in on the fun again next week! No lol , I'm not from that area of the states. That is cool though that were were heading there.